My hometown Chongqing is one of the four direct-controlled municipalities of China, locates in southwest area. Hot pot is the first label of Chongqing. However a new trend is the plain Chongqing noodles(xiaomian 小面). 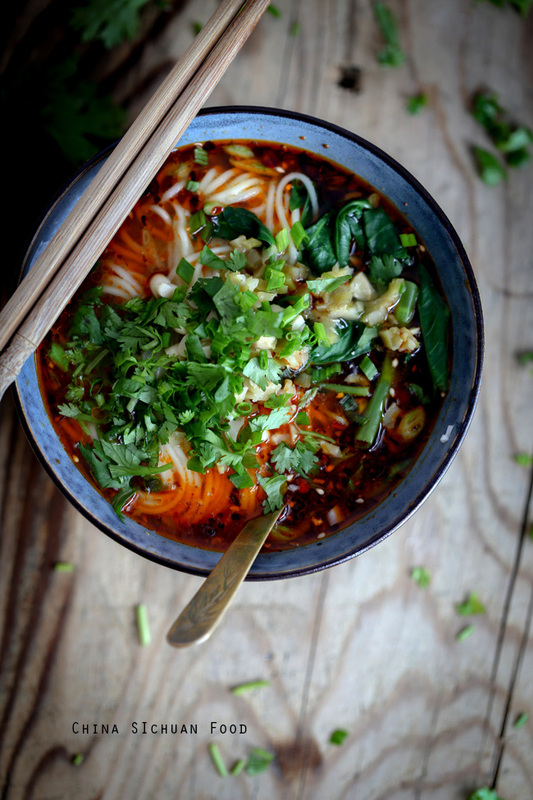 Xiaomian refers to a group of plain noodles seasoned with vinegar, sugar, red oil, ginger and scallion. Sometimes the noodle may topped with braised beef(牛肉小面), braised beans, braised pig’s large intestines, fried meat sauce (炸酱面). Nooldes in northen China emphasis on the soup base and the quality of noodles, while Chongqing noodles requires more on seasonings. People in Chongqing love xiaomian in the morning as same as they love hot pot when the sun goes down. Now, you may be charged only 5 RMB to 8 RMB for a morning Xiaomian in Chonqing. In Shenzhen, there are also chain restaurants selling authentic Chongqing noodles with a much higher price around 25 RMB. 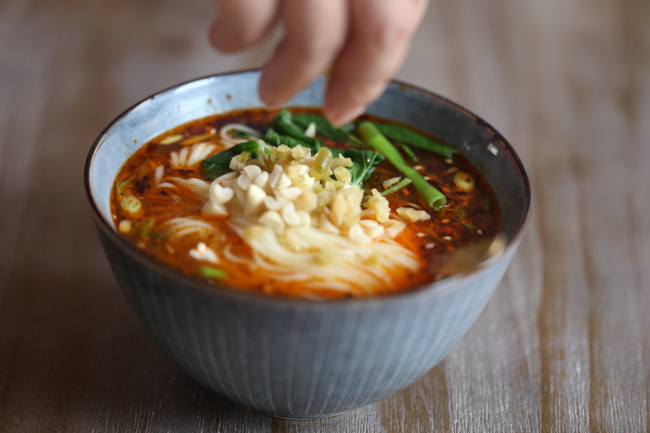 An interesting thing is that Chongqing people even list a top 50 Chongqing noodles ranking. 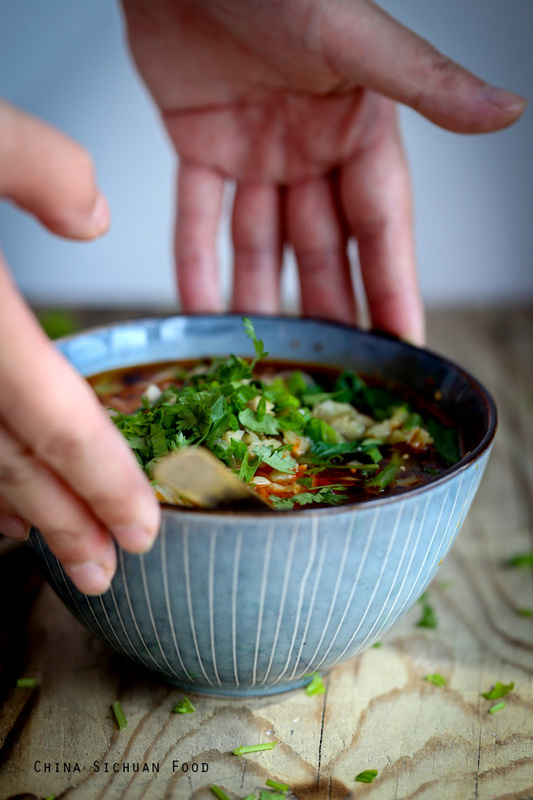 It is not hard to reproduce the charming Chongqing noodles at home, but there are several extremely important popular Chinese seasonings you will need to prepare for a successful Chongqing noodles. 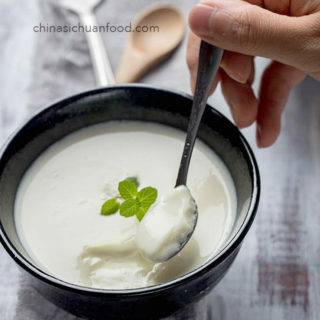 Lard(猪[zhū]油[yóu]): lard has been the most popular eating oil for Chinese people with a quite long history. But recently, as most of us are facing over nutrition problem, lots of people choice to eat vegetable oil as daily cooking oil. However lard is extremely for a plain Chongqing noodles without stock soup base. You can directly use pork stock and skip lard. For vegan readers, use sesame oil to replace lard. However the noodle tastes slightly different without animal fat. 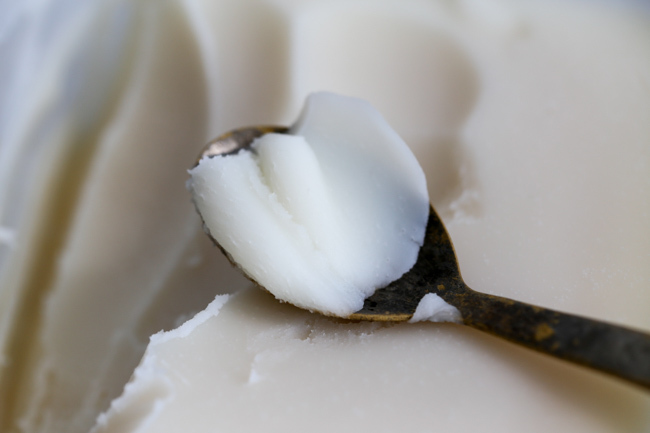 Another option is to render lard at home. 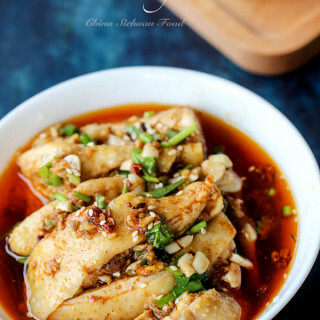 Monosodium glutamate (味[wèi]精[jīng]): monosodium glutamate is a very popular seasoning in Sichuan cuisine. It is essentially used as a taste enhancer and is said to impart a sixth sense, known as savory (鲜(xiān)), in addition to the five basic tastes (sweet, spicy, bitter, sour and salty). You can use chicken powder to replace monosodium glutamate. 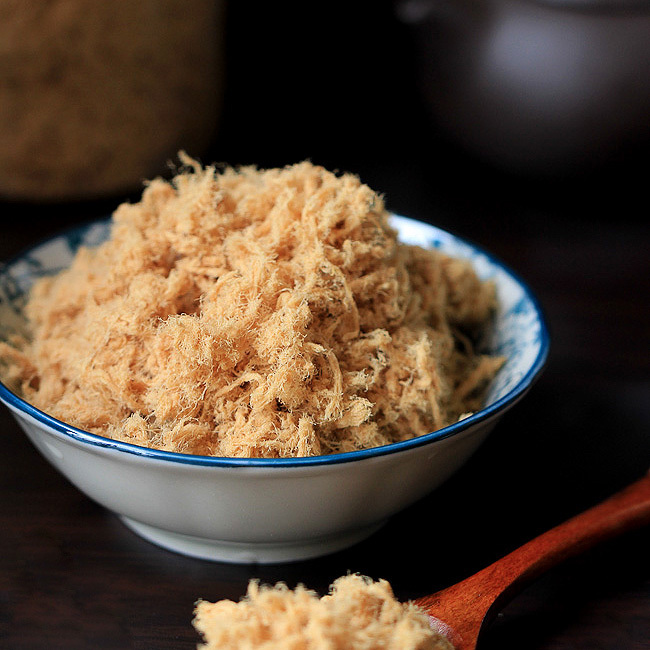 Chicken powder(鸡(jī)精(jīng)): usage of chicken powder is very similar to monosodium glutamate. You will need to use one of the two at least or prepare both for the best result. 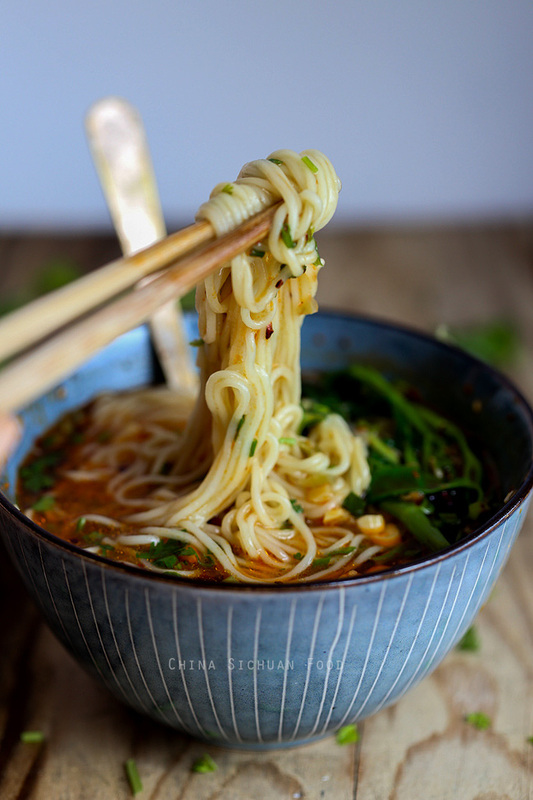 Thin alkaline noodle: Thin alkaline noodle is called as 水面(碱水面) in Chongqing and it is the top star in the noodle group. 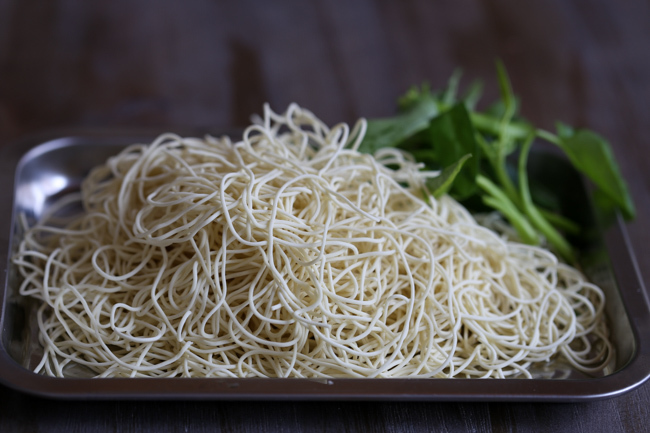 You can make some with alkaline powder or use round thin fresh noodles instead. Szechuan style red oil is a combined red oil made with red pepper powder and lots of popular Chinese spices. 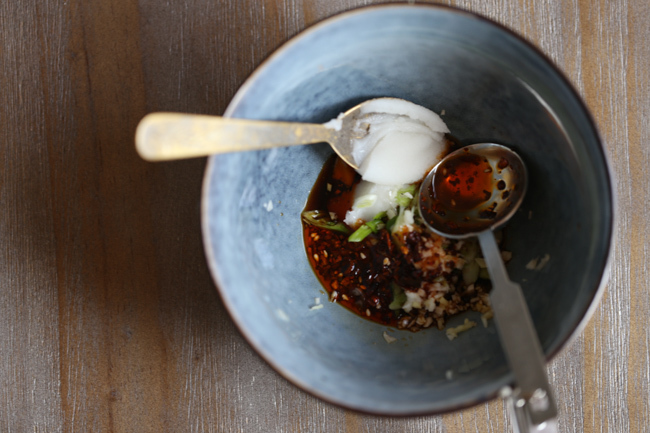 Check Elaine’s homemade Chinese chili oil if you love to make it at home. It should be a great gift idea for foodie friends. 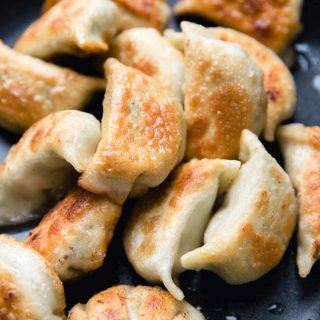 In the serving bowl, add a small pinch of salt, vinegar, soy sauce, gourmet powder, minced green onion whites, minced garlic, minced ginger, chili oil, sesame oil and lard. Cook noodles in boiling water according to the instructions on the package. 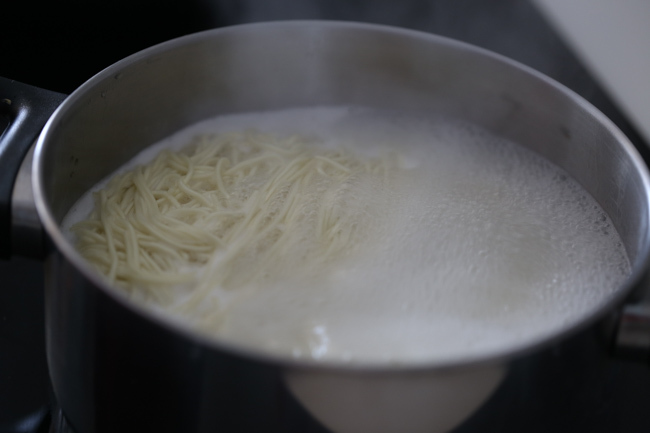 Pour some noodle cooking soup into the serving bowl to tune the seasonings. And then transfer the noodles to serving bowl. Rinse the greens and transfer to serving bowl too. Garnish peanuts, minced green onions, minced coriander and minced Zha cai. Add more chili oil if a stronger taste is wanted! Serving immediately. It’s best to finish the noodles within 10 minutes. Garnish peanuts, minced green onions, minced coriander and minced Za cai. Add more chili oil if a stronger taste is wanted! Should I assume distilled white vinegar or some other type of vinegar? This looks great! My fault Tom! 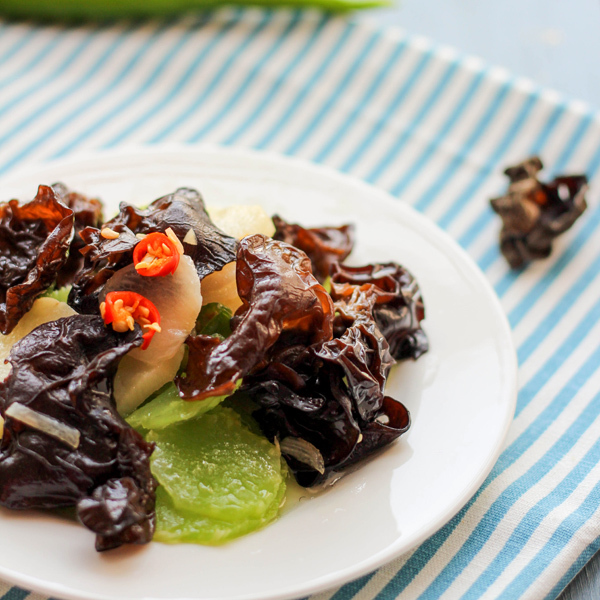 I should have pointed that I used black vinegar(香醋) for almost all of my spicy recipes. I’m back in Asia for vacation and I’m drowning myself with plenty of noodles. I just love them. Never had chongqing noodles but from the looks of it, I know for a fact, it’s plenty delicious! Yum! I cook noodles at least twice as a breakfast. 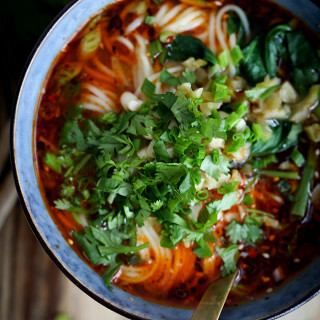 This chongqing noodle is extremely popular in China in recent years. Hope you will try it some day Ping. It is so good especially in winter. Please don’t drown your self coz am here to help you eat the noodles if you need help ha ha😀 I luv eating spicy or Dan Dan noodles to the marrow of my bones. Don’t some versions add sesame sauce as well? Is this a matter of personal preference or regional variation? I believe sesame sauce in soup noodle is a personal preference, as the sauce is quite spicy and strong (comparing with sesame sauce). But you can definitely add some for your personal bowl. 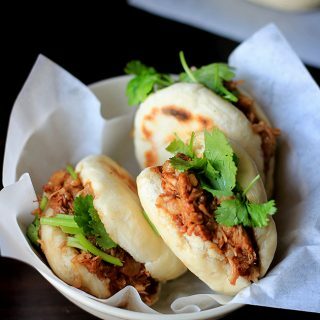 We still need to wait some time for your favorite maocai. I love it so much too. The hot weather makes the process so challenging. 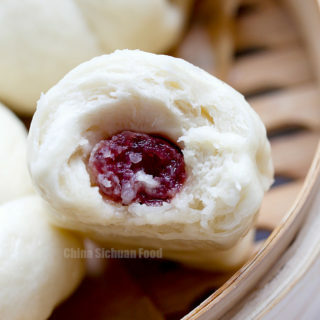 This recipe is a godsend; it’s been almost 5 years since I’ve been in Chongqing, but the taste of xiaomian still haunts me in my dreams. Thank you for this post! Xiaomian is my favorite breakfast. Hope you like it. Do you have any recommendations for a lard substitute that would be vegan/vegetarian? 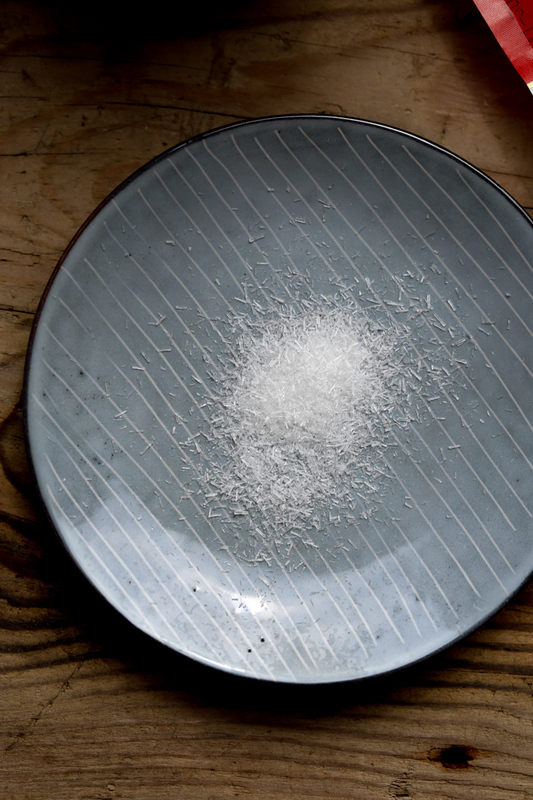 If you don’t want to have lard, you can use sesame oil. gàn niŭ wān zá miàn. Do you happen to have a recipe for something similar if it’s not actually this one? I am having such a hard time finding anything and am missing these noodles! Thanks so much for the yummy recipes! 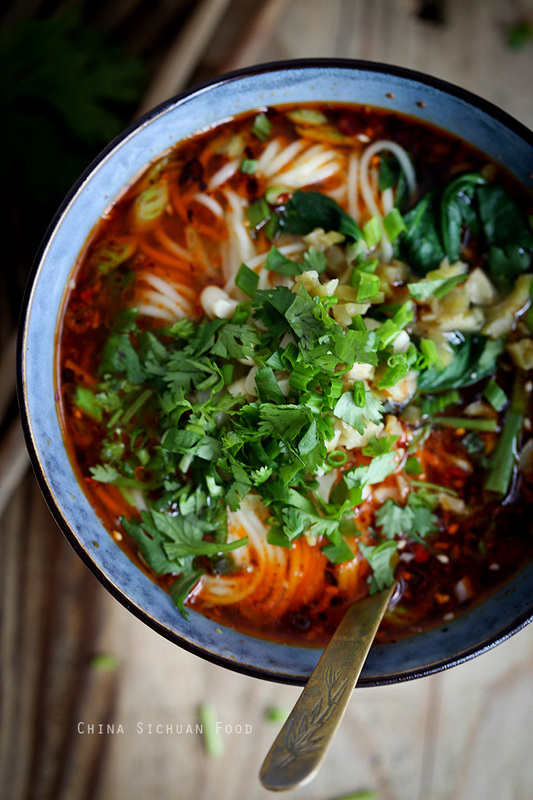 Wan Za Mian is a very famous dish in Chongqing. The two are quite similar but Wan Za Mian gets a topping with cooked peas. I will post a recipe introducing it soon. Keep returned! Did you happen to post a recipe with the peas yet? Hello, this is a great piece! What are the nutritional facts for this dish? Sorry that I did not calculate nutritional facts for this dish. This is literally the best noodle dish I’ve ever had, bar none. I’ve done it without the lard….don’t do that! The lard takes this dish into the stratosphere. Thank you for changing my life with this dish and your site! Thanks Joe for such an wonderful comment. We call this xiao noodles meaning small noodles in my hometown but it wins your supreme comment.Happy cooking! Lived there for a few months, The food, The people, The girls indescribable! You get the all the good points about Chongqing. I lived in Chongqing with Mu family for 4 years. I love Chongqing noodles and the numbing pepper. Good food and nice friendly people. It should be your favorite breakfast for quite a long time. This is easily one of my favourite recipes on here – or maybe anywhere. 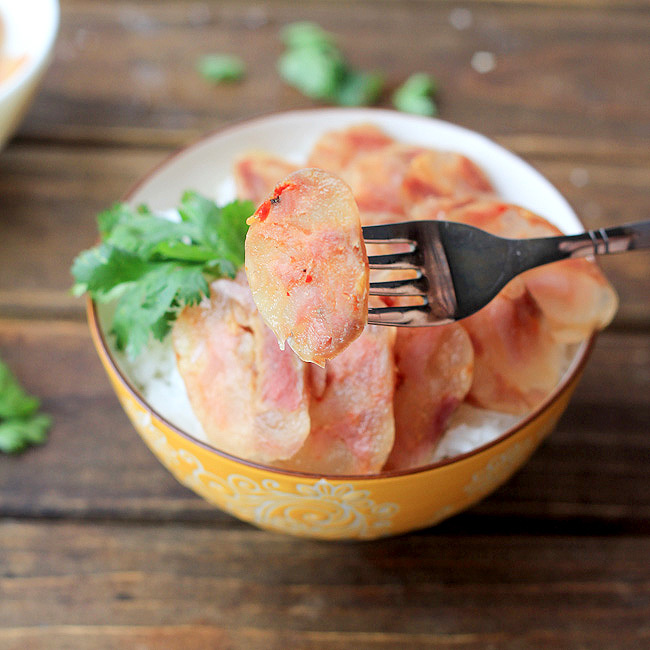 It is such a satisfactory and yummy dish, yet easy, quick and cheap. And its very easy to “expand” it by adding other vegetables or meat. 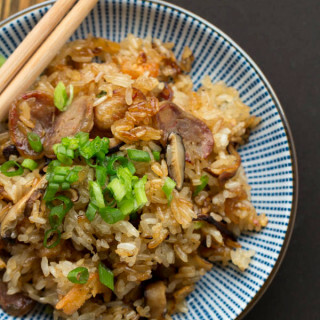 I am planning on making it tomorrow, maybe with some additional bean sprouts, thinly sliced radish and either ground, fried pork or sliced chicken breast on top. We have lots of toppings to choose from in Chongqing. Pork and chicken seems quite yummy. Hope it turns out good for you. 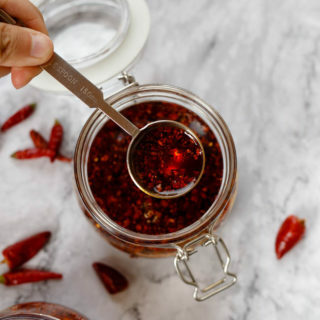 If you want to make a customized hotter version of Chili oil, check this post. The hot level can be achieved by adjusting the ratio of different types of peppers.